All Viburnum species potentially, but European Cranberry and its cultivars are its preferred host. Adults and larvae of this beetle skeletonize foliage giving it a tattered appearance. Eventually the larvae in dense populations devour all of the leaf except the major veins. This insect is a European import. Eggs overwinter in twigs of last year’s growth. 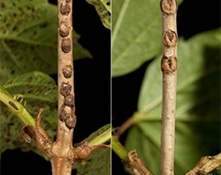 The female chews square holes in the bark of twigs and deposits several eggs (up to 500) in each hole. She covers these holes with a cap of black excrement and fragments of chewed bark. The cap soon hardens, providing protection from predators and provides insulation. 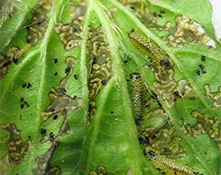 In May of the following year, larvae hatch and begin feeding gregariously as leaves emerge in the spring. Adults begin to appear about mid-July and may be seen until the first frost. 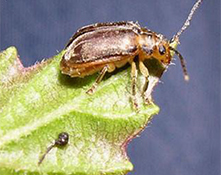 With a high reproductive potential, a favourable overwintering location and an abundance of host plants both native and ornamental, this beetle is considered a potentially serious threat. Prune out and destroy terminal shoots (containing eggs) before May 1. If insecticides are deemed necessary, early timing is critical.